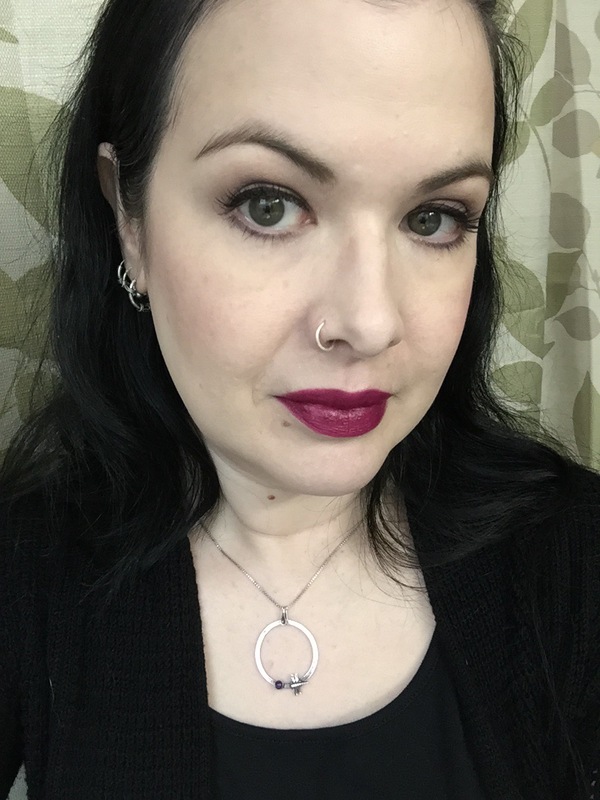 When the weather starts to change, I start to change up my makeup a bit. I start to wear more dramatic lip colors and often reach for plums, berries, burgundies, and wines. MAC Rebel is a lipstick in their permanent collection that is perfect for when the days just start getting shorter and the leaves are just starting to drop. Face: Smashbox Photo Finish Primer on t-zone (this is an experiment to see if this behaves badly with my foundation, which is water based), MAC Face and Body Foundation (2/3 N1 mixed with 1/3 White), NYX HD Concealer in Porcelain around nose and under eyes (I am now rationing my NARS concealer, ha! ), MAC Studio Finish Concealer in NC15 on random pigmented spots, face set with Rimmel Stay Matte Powder and a puff to set and mattify, NYX HD Blush in Taupe to contour, MAC Mineralized Blush in Gentle, no highlight needed with dewy foundation and shimmery blush. WOW this lighting washes me out. We got new light bulbs. Not sure I’m a fan! This entry was posted in beauty, beauty blog, beauty blogger, Lips, Lipstick, mac lipstick, Makeup of the Day and tagged beauty, beauty blog, casual goth, fall lipstick, fall makeup, goth makeup, mac cosmetics, mac lipstick, mac makeup, makeup, makeup blog, makeup look, mature goth, mature makeup, plum lipstick, purple lipstick by Rachel. Bookmark the permalink.